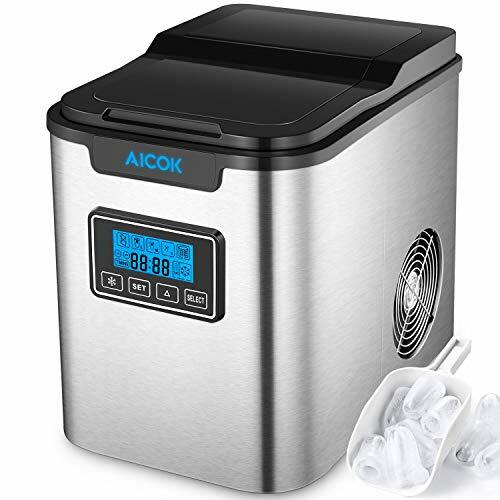 Aicok portable ice maker could easily blend in your house, office or outdoors. The transparent viewing window lets you follow the ice making process without lifting the lid all the time. The water tank has a large capacity of 2.3qt and an ice basket of up to 1.8lb. You can also pre-program the ice machine with the timer. The intelligent LCD control panel shows you all of the necessary information during working, including error indicator, ice cube size setting, timer indication, ice status and also a water gauge. ETL certified. Specifications:Power: 110-120V~ 60 Hz Weight: 11.5kg/25lb Product dimensions: 9.8 "L x 14.17" W x 12.87 "H (249 * 360 * 327mm) NOTE: ☆This ice maker is insulated and by definition not a freezer. The ice cubes will not be frozen in the ice machine. Use a separate freezer for this purpose. ★The innovative technology of the device can reuse molten water - saving time and water. ☆The ice production may be poor in the first 5 rounds, because the refrigeration system is not yet stably running. ★It is recommended to add water to the maximum water level, draining the air inside the pump ☆Please place the product on a stable, ventilated, clean countertop. ★The timing function is a kind of mechanical timing, thus might have errors and cannot be used as a clock. ☆In order to ensure the normal use of the product, we have attached an extra drain plug to the front page of the manual, please keep it for emergency use. ★Before usage, please check the drain plug and the inner silicone plug to prevent water leakage. ☆When the product starts to make ice, do not press other buttons frequently, to prevent the ice making process from being stopped. ★If a new machine does not make ice, it may be backflow of refrigerant caused by transportation. Please wait for 24 hours before using.